The Very Hungry Caterpillar is designed, illustrated and written by one of the most celebrated children’s authors of all time, Eric Carle. First published in 1969, The Very Hungry Caterpillar continues to appeal to generation after generation and is now preparing to celebrate its 50th anniversary in 2019. 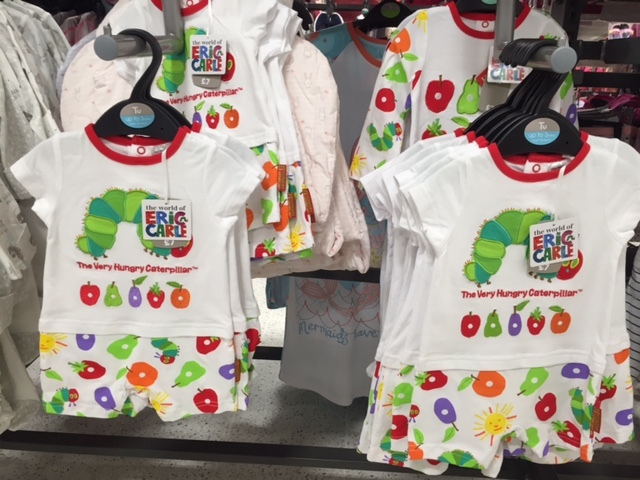 This spring, a new range of babywear, suitable for ages newborn to 12 months, launched at Sainsbury’s stores nationwide and online in the United Kingdom. The eye-catching collection features iconic imagery from the classic picture book, embroidered details and a bright color palette on an array of products including sleepsuits, rompers and towels. The beloved title is one of the most-read children’s books in the United Kingdom. More than 44 million copies of the classic picture book have been sold worldwide, with one being bought every 30 seconds. To support the product launch, PR partner License to PR executed a robust PR and influencer campaign, resulting in coverage in Mother & Baby Magazine and several top mummy blogs including What Kathy Said, Amy and Tots and Life as Mum. As the global brand licensing agency for The World of Eric Carle, The Joester Loria worked with U.K. partner Rocket Licensing on this exciting new brand extension. Licensing programs engineered by the Joester Loria Group do more than just increase brand awareness. Our marketing know-how, retail expertise and creative excellence significantly impacts consumer engagement and help brands grow!